All Fired Up isn’t just for the kids! Whether there are 5 or 50 of you, our creative hen parties are relaxing and a fun way to spend your time with your friends during your hen weekend. We can comfortably seat up to 25 and have on some occasions had all 50 seats in the studio occupied for a single event. Parties last 2 hours. All items will be ready for collection in 7 days, or we can post them for an additional postal charge. We can supply a buffet for £7.95 per head. Please click on the link to see the menu choices. You are welcome to bring wine and we will open it for you and provide glasses at no charge. Please note we cannot allow soft drinks, we offer a wide variety in our chiller cabinet. Evening bookings are also available for groups of 10 or more. 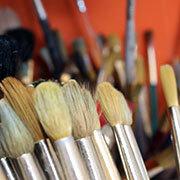 If you would prefer to have the studio to yourselves we can hold evening parties for groups of 10 or more. As with Hen parties you can bring wine and we will open it and supply glasses at no cost. 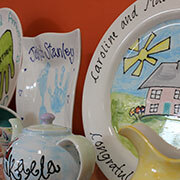 £11.50 per painter choosing from a selection of 5 items, a plate, 2 mugs and 2 bowls. 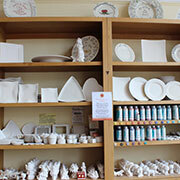 This includes all paint, glazing and firing in our kilns. 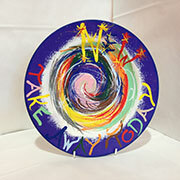 Items will be ready for collection or post in 7 days. This is for 8 or more. 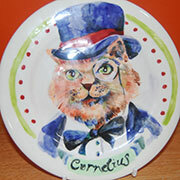 £3 Studio Fee plus the cost of the item you would like to paint, ceramics start at £3.50. 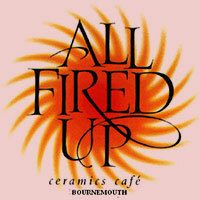 All Fired Up can also cater for Team Building events or any group activity. 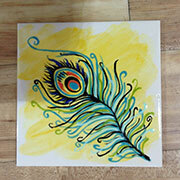 Creative painting has proven to be a great way of bringing people together.